Suriya’s Pasanga 2 has been well received by film patrons for the novel message it carries for the wellbeing of children and significance of responsible parenting. To better this experience and increase the accessibility of this film the presenter's 2D Entertainment has announced that the entry to children below 10 years is free in districts like Coimbatore, Trichy, Tirunelveli, Tanjore, Kanyakumari and South Arcot. This is sure to increase the commercial returns too as the kids will be accompanied by their parents. This is a smart move and also a noble one! 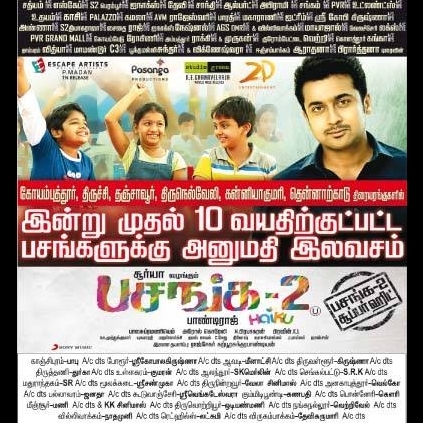 Way to go team Pasanga 2! Inji Iduppazhagi, Eetti, Pasanga 2 And Pugazh Get 'U' Certificates From The Censor Board. People looking for online information on Pasanga 2, Suruiya will find this news story useful.